The North American Soccer League was the top-level professional soccer league in the United States and Canada from 1968 to 1984. It was the first soccer league to be successful on a national scale in the US. Its popularity peaked in the late 1970’s. The league averaged over 13,000 fans per game from 1977 to 1983, and league matches were broadcast on network television from 1975 to 1980. The league's highest profile team was the New York Cosmos. The Cosmos signed a number of the world's best players including Pelé, Franz Beckenbauer, Giorgio Chinaglia and Carlos Alberto. The Cosmos averaged over 28,000 fans for each season from 1977 to 1982 while they averaged more than 40,000 in three of those years. The NASL came about as a result of the surprisingly large North American TV audience of over 1 million for the 1966 FIFA World Cup. This led American sports investors to believe there was an untapped market for the sport in the U.S. and Canada. The NASL began play in 1968. In the early 1970s, the league was more of a semi-pro league, with many of the players holding other jobs. On September 3, 1973, Sports Illustrated featured a soccer player on its cover for the first time; Philadelphia Atoms goalkeeper Bob Rigby. The 1975 season saw the signing of internationally known players, including Portuguese star Eusébio and Pelé. Pelé's signing for the New York Cosmos created a media sensation and transformed the fortunes of soccer in the United States. From the moment he signed his contract Pelé's every move was followed, bringing attention and credibility to soccer in America. The New York Cosmos' home attendance tripled in just half the season Pelé was there, and on the road the Cosmos also played in front of huge crowds that came to watch Pelé play. Pelé's arrival resulted in greater TV exposure for the Cosmos and for the league. Ten million people tuned in to watch CBS' live broadcast of Pelé's debut match with the Cosmos on June 15, 1975 against the Dallas Tornado at Downing Stadium in New York. 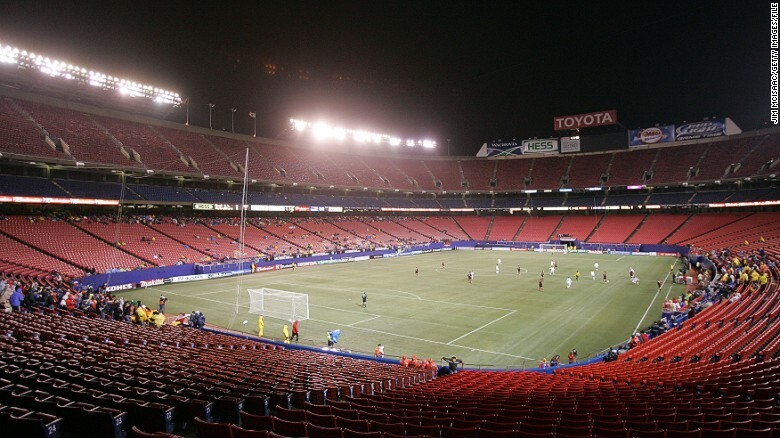 It was a record TV audience for soccer in the US. By 1976, NASL was being picked up by the mainstream media, with the sports pages of newspapers covering the league. 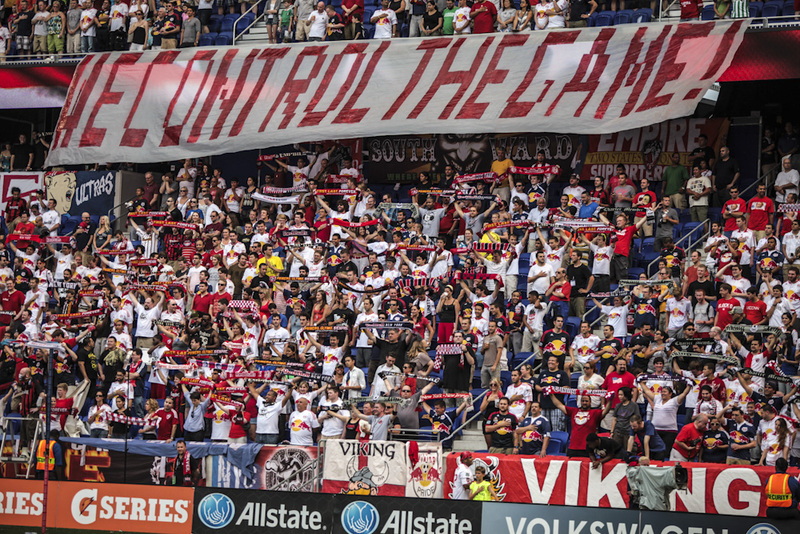 The biggest club in the league was the Cosmos, who drew more than 40,000 fans per game at their height. Giants Stadium sold out (over 73,000) for the Cosmos’ 1978 championship win. At the end of the 1970s, the league seemed poised for moderate success. The 1979 season had seen attendance increase by 8%. An apparent era of stability seemed to have arrived. 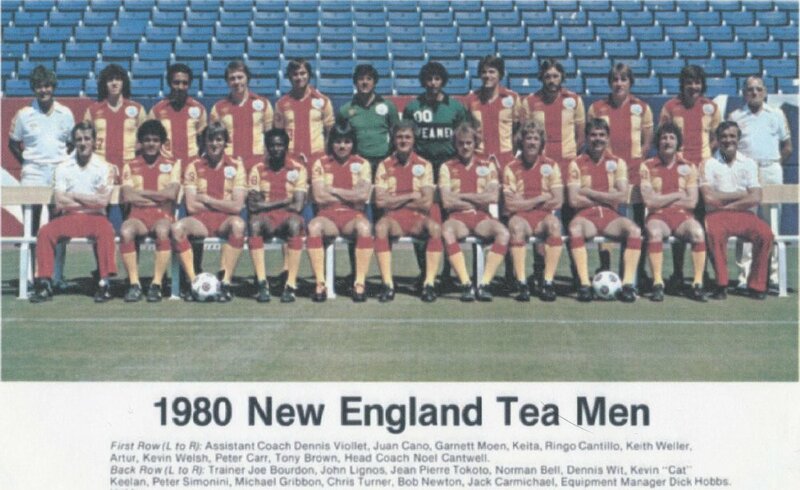 However, at the close of the 1980 season, NASL's woes were beginning to mount. The league was feeling the effects of over-expansion, the economic recession, and disputes with the players union. In the early 1980s the U.S. economy went south with unemployment reaching 10.8% in 1982 It was the highest level since World War II. The league’s owners, who were losing money. One of the biggest worries for the NASL was that owners were spending sums on player salaries that could not be covered by league revenue. In 1980 NFL owners were spending on average 40% of the team's budget on player salaries. NASL owners were averaging over 70% of their budget on player salaries. The Cosmos in particular, owned by Warner Communications, were spending a ton on player salaries. Teams such as Los Angeles, Jacksonville, Portland, Toronto, and Montreal (also owned by major corporations) could keep up with the Cosmos. Owners without financial backing could not keep pace. Owners spent millions on aging stars to try to keep up with the rest of the league and lost a lot of money in doing so. The league’s 24 teams rang up a deficit of $30 million in 1981 and five teams folded at the end of the season. The league lasted until 1984 with only nine teams taking the field. On March 28, 1985, the NASL suspended operations. Although the NASL ultimately failed, it did introduce soccer to the North American sports scene on a large scale for the first time. It was a major reason soccer became one of the most popular sports among American kids. It also led to FIFA awarding the 1994 World Cup to the United States. Lastly, the NASL provided lessons for Major League Soccer, which has adapted a philosophy of financial restraint as the league continues to grow. 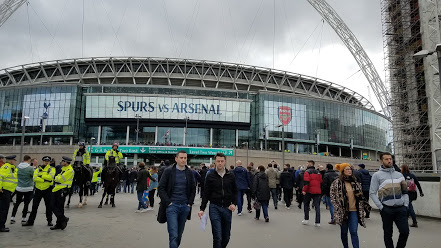 In my previous blog post entitled Five matches in 12 days, three stadiums and not one drop of rain - Part 1, I began to detail my recent trip to London where I attended five matches in less than two weeks. 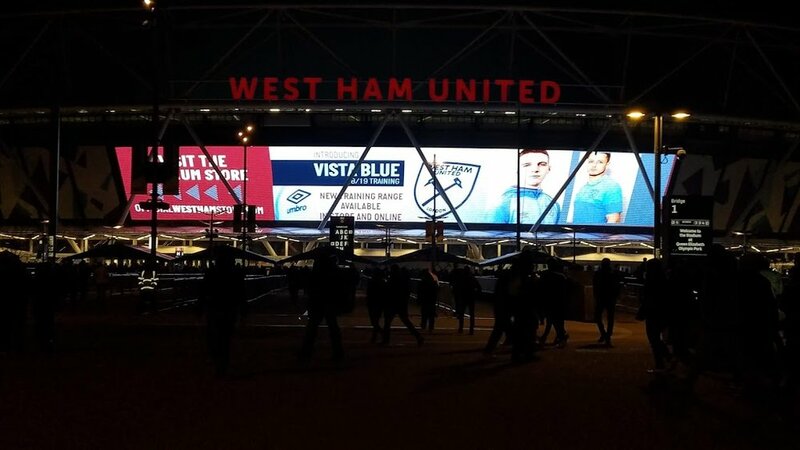 I first saw Arsenal defeat Bate Borisov at Emirate Stadium on Thursday, February 21st and then got to see West Ham beat Fulham at the London Stadium the very next night. That match also included West Ham’s “World Famous” bubbles. Here’s what came next in my football odyssey. Match number three was on Sunday, February 24th versus Southampton. This is the match that started my entire adventure. (I won a trip to London through the Arsenal NYC supporters club including roundtrip airfare and a ticket to this match). The weather was very un-London like with bright blue skies and temperatures in the 60’s as I head out for this 2PM kickoff. I wanted to take in the full pre-match experience so my first stop was Piebury Corner where I ordered the Dennis Bergkamp. Then it was off to the Emirates where it was buzzing with anticipation. This one looked like it was going to be a blow out as Arsenal led 2-0 after just 17 minutes. Lacazette got the first on a rebound off a Henrikh Mkhitaryan shot. Mkhitaryan scored the second just 11 minutes later. Arsenal continued to dominate the game and had the bulk of the possession. There was no additional scoring, but it was great to see Arsenal keep a clean sheet in a league match for a change. Interestingly the two people sitting next to me were from Brooklyn. 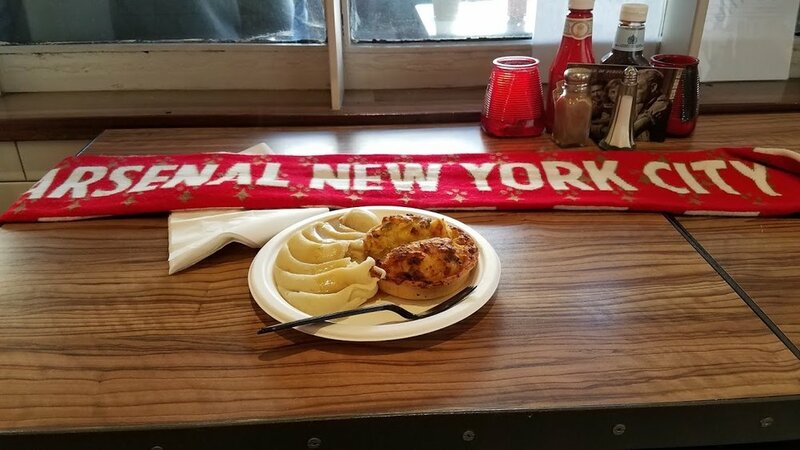 It turns out they are also Arsenal NYC members and were able to purchase tickets through the supporter’s club. As I’ve said before, it doesn’t matter where you go in the world, you’ll always run in to someone from NYC. Three days later and the sun was still shining as I prepared to take in Arsenal’s third match in six days. Bournemouth were in town for a Wednesday 7:45PM kick off. Before heading to the Emirates I decided to pay a visit to see what had become of Arsenal’s old home ground, Highbury. The stadium was turned in to a condominium community called Highbury Square in 2009. The front entrance to the old stadium still stands and the grass in the center of the community is part of the actual pitch that players such as Henry, Bergkamp, Adams, Seaman and more used to play on. 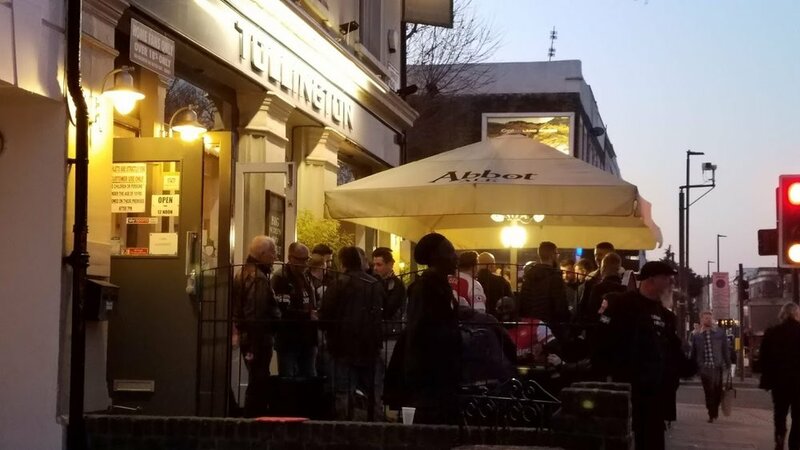 From there I paid a visit to my favorite Arsenal pub, the Tollington. It was starting to fill up with Gooners having a pint or two before the game. Then it was time to head off to the stadium. This was the best match of them all as Arsenal ran riot. Once again Mesut Ozil was given a start and he quickly proved his doubters wrong. Ozil had the ball in the back of the Bournemouth net in the 4th minute. Goal number two was scored by Mkhitaryan in the 27th minute. 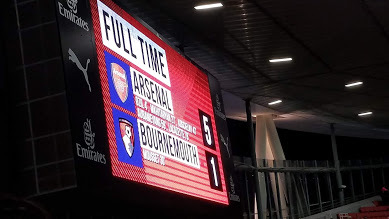 The only glaring error in this one was made by young Matteo Guendouzi who was caught in possession by Bournemouth’s Lys Mousset. Mousset easily pulled one back for the Cherries (yes, they are called the Cherries). In the end it didn’t matter but hopefully the 19-year-old will learn from his mistakes. Koscielny, Aubameyang and Lacazette each scored in the second half to give Arsenal a comfortable 5-1 victory. Four matches were now in the books after just one week in London. There was one more fixture on my wish list and that was the North London derby scheduled at Wembley just three days later. The problem now was how to get tickets. Since this is an in-demand fixture there weren’t a lot of options. I couldn’t get any from the Tottenham ticket office so I turned to Twitter. There were folks selling tickets here, but to say the prices were inflated would be an understatement. Aaron Ramsey scores, Spurs fans start that annoying come on you Spurs chant. The match was scheduled for 12:30PM on Saturday. I met my friend outside the Wembley tube station and to my horror, I was surrounded by the enemy. Spurs fans were everywhere. Not wanting to find any trouble, I made sure to not wear any team colors and to try and keep my mouth shut. The energy in the stadium was high as the match kicked off. When Aaron Ramsey ran free towards the Tottenham goal it felt like time stood still. He coolly slotted home and for a moment I started to celebrate. I caught myself as I didn’t want all the bummed out Spurs fans sitting around us to find out that I was a supporter of their hated rival. I did chuckle to myself though and enjoyed the moment. Arsenal played great and everything seemed to be going well until Harry Kane did what Harry Kane always does and dropped to the ground at the slightest touch to win a penalty for his side. He scored from the spot and celebrated as if he had won the World Cup. Late in the match Aubameyang was fouled and the ref pointed to the spot. I knew right then that Arsenal were going to win 2-1. I was ready to celebrate. Unfortunately, I was wrong. Aubameyang’s shot was saved and the match ended 1-1. It was one of those draws that felt like a loss, but Arsenal played really well and took 4 points out of 6 against Spurs for the season. I’ve always heard these North London derby matches are dangerous with a lot of fighting among rival fans. While I did see some fans yelling at each other while surrounded by police, I didn’t see any hooliganism on display at all. The worst part of the entire day was trying to get out of Wembley. 62,000 people poured out of the stadium at the same time and headed for the tube. We encountered nothing but human gridlock. Basically we were trapped and had to figure out how to “Escape From Wembley”. Two and a half hours later after two bus rides and a train, we finally made it home. Definitely a nightmare scenario. The next day I was off to Heathrow for my flight back to New York. I had seen four Arsenal matches and five games in total in 12 days. It was definitely an amazing experience. I am an Arsenal fan and therefore was thrilled when I received a notification from the NYC Arsenal supporters that my name had been chosen at random to win a trip to London to see an Arsenal match including roundtrip airfare and a ticket to see Arsenal play Southampton at Emirates Stadium. As I planned the trip I noticed that Arsenal had three other games in London during the time that I would be there. Two were at home and one was the North London derby versus Arsenal’s hated rivals Tottenham. That match would be at Wembley Stadium and would prove a bit difficult to obtain tickets for. Purchasing tickets for a Premier League match is hard work. However, where there’s a will, there’s a way. 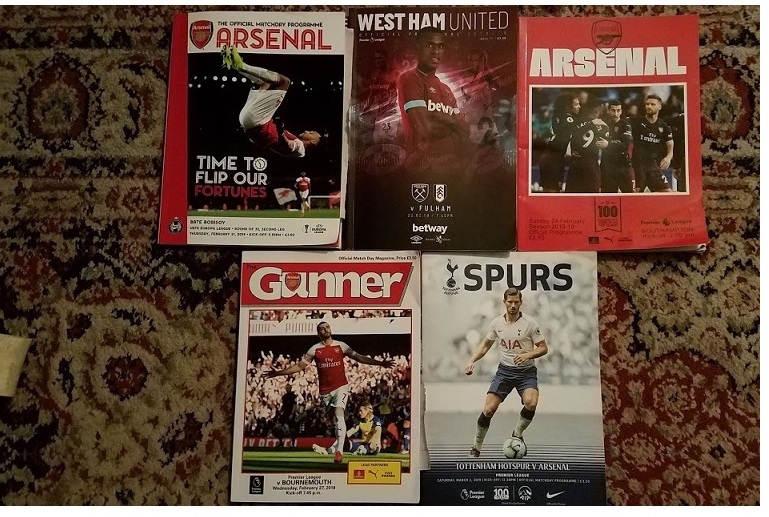 I was able to secure tickets for the two other Arsenal matches at the club’s home stadium as well as tickets for West Ham’s home match versus Fulham. Friends of mine in London are West Ham fans so I thought it would be a nice idea to get tickets for everyone to see this game. The first match was on Thursday, February 21st and it was the second leg of Arsenal’s Europa League round of 32 meeting with the “mighty” Bate Borisov. Somehow Arsenal managed to lose the first leg in Belarus so there was a bit of tension among the fans heading in to the game. 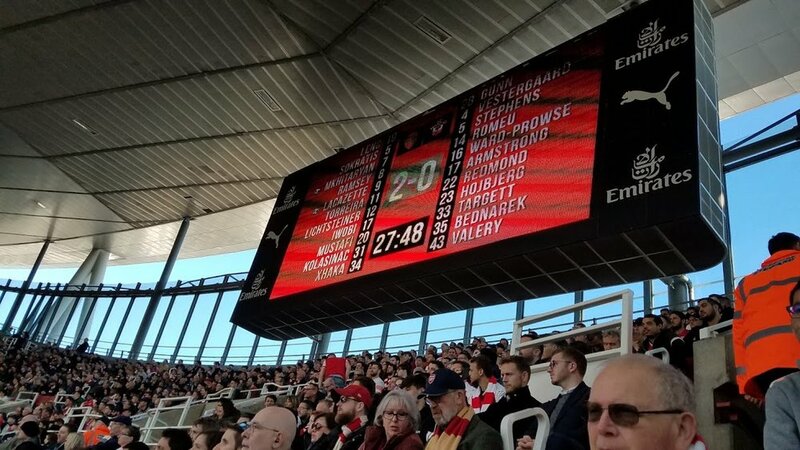 That didn’t last long as Arsenal took the lead within four minutes as Pierre-Emerick Aubameyang's cross was kindly turned in to the Bate goal by Bate defender Zakhar Volkov. Arsenal had a 1-0 lead and the tie was now 1-1 on aggregate. Arsenal dominated play and despite the fact that none of the Arsenal offensive players were able to score, the defenders contributed with goals. Shkodran Mustafi headed home just before half time and Greek defender Sokratis put the match to bed with a header of his own in the 60th minute. Arsenal won the match 3-0 and the tie 3-1 on aggregate. The funniest thing about the match was that the family sitting next to me were from Glen Cove, Long Island. Also, my friend Marianne, who went to the match with me, lives in London but is originally from Brooklyn. As I always say, wherever you go in the world you will meet New Yorkers. Game two was the next night as West Ham hosted Fulham at the London Stadium in Stratford. The stadium was built for the 2012 London summer Olympics and is the new home of West Ham United. As we walked up a never ending set of stairs, we found our seats in row 72. It was the second to last row in the stadium. Despite this the mood was jovial and I was looking forward to the bubbles…yes, the bubbles. A lot of the teams in England have theme songs. Some make sense (Leeds Marching on Together or Manchester City Blue Moon) while others are a bit odd. West Ham adopted the 1918 song I’m Forever Blowing Bubbles as the club anthem in the 1920’s. 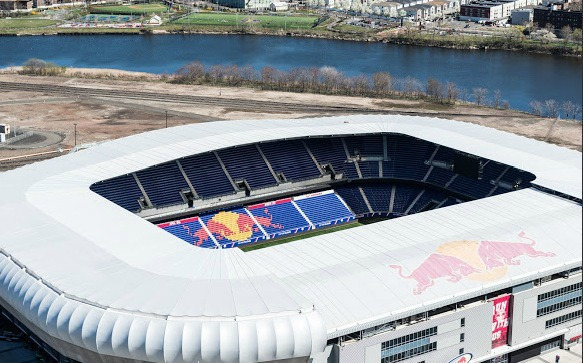 In keeping with the theme, the club releases bubbles in to the stadium before the match and every time the home team scores. The song is a bit nerdy but that didn’t stop the fans and lots of big guys with beer bellies from belting out the lyrics with gusto as the bubbles flowed. Even thought it was a rare Friday night match, the crowd appeared family oriented. Despite this fact, the guys behind us in the 73rd row (the LAST row in the stadium) didn’t think twice about sneaking in beers, yelling at the ref as if he could hear them and using cute English swear words for all to hear including the kids sitting all around them. West Ham seemed to be asleep at the beginning of the match. Fulham went ahead in the third minute and the tension inside the stadium grew. Luckily that didn’t last long as West Ham were ahead 2-1 by half time. First, Chicharito equalized in the 29th minute. Apparently his arm helped the ball go over the line and it was therefore a controversial goal. (Of course we couldn’t tell that from the 72nd row but we read about it the next day in the papers). The second goal came on an Issa Diop header in the 40th minute. West Ham dominated the second half and the bubbles flowed once again when Michail Antonio scored the Hammers’ third goal in added time. The final score 3-1 to the home team. The crowd left happy and we were shuttled out of the stadium with the crowd and ended up in the middle of a mob of fans shouting come on you Irons, come on you Irons, come on you Irons (the nickname for West Ham) over and over as we slowly made our way to the tube. I had two more matches remaining and possibly a third if I was able to secure tickets for the North London derby at Wembley Stadium. Stay tuned for all the excitement next time in Part 2 of Five matches in 12 days, three stadiums and not one drop of rain. Supporters love to complain about their team, their players, the owners or whatever it is that is going wrong with the club that they support. In fact some of us probably know someone like my friend Joe. Joe is a supporter of teams that just never win. He complains so much that I am convinced he would be upset if his teams suddenly became winners. Then he’d have nothing to complain about. For those fans that are never happy, there’s a new club for you to support. Pro Piacenza The team plays in Italy’s third tier professional league Serie C.
Then came the teams match at Cuneo. To say that Pro Piacenza lost would be an understatement. The final score of 20-0 would be the equivalent of losing a Major League Baseball game 60-0 or an NFL game 144-0. It was shocking. Part of the reason they were ripped to shreds is the fact that Pro Piacenza only had seven players for the entire match. The club now faces the possibility of being tossed out of the league. Former player Dario Polverini walked out on the club in January to join fellow Serie C team Virtus Verona. He explained Pro Piacenza’s current situation. A really strong squad was built in July and we went into our preseason training camp with high hopes. At the end of August, the sporting director was fired because the president wanted to raise the bar and aim for [promotion to] Serie B. Ten new players arrived in the final days of the transfer window and we had a squad of 33 and a really high budget for this level. We won three and drew two of our first five games and were top of the league, then when the first deadline arrived on Oct. 15, the owners didn't pay the wages. In fact, in November our wages for August arrived, albeit without the [social security and tax] contributions, so it was practically cut in half. At the deadline in December, the payments didn't arrive, despite reassurances from the president, and the situation deteriorated. In the meantime, rumors started doing the rounds in the city and the owners of our apartments told us that if we didn't pay [the rent], we would have to leave. A lot of us were forced to do this, even players with families and children. The club tried to put some up in hotel rooms, but you can't live your life out of a suitcase in the boot of your car, being moved from one place to another. We decided to go on strike to put the president's back to the wall, but he doesn't care. We skipped one, two and then three games, and then there was the winter break. Nothing had changed when we came back and almost all of us decided to leave. It was surreal talking to Pannella. For him, the problems didn't exist, not even when faced with the evidence. So there you have it. The next time you’re annoyed that your team threw away a lead, one of your players is red carded or your owner brings in no new players during the transfer window; realize that things could be worse. As bad as it gets, it can never reach the levels of bad that is Pro Piacenza! The next World Cup is scheduled to take place three years from now in the tiny Gulf Coast nation of Qatar. When the decision was made by FIFA back in 2010 to award the tournament to Qatar it was obvious that bribery and corruption were the main reasons that this odd choice was made. I wrote the following back in 2010 after the games were awarded and they still apply to this day. How FIFA can allow this fiasco to move forward is beyond me. Is that oil I see dripping from the money stuffed in FIFA delegate's pockets? Can’t wait to see what happens when Israel qualify, as well as Budweiser the official world cup beer's stance. With only 2 cities in the whole country, are fans expected to camp in the desert? The Qatar stadiums look awesome, but they have one fatal flaw: they're in Qatar. Ironically, we have been awarded the 2022 Oppressive Regime Against Women And Homosexuals World Cup. And who will be building all these stadiums and roads in Qatar? No doubt workers imported from abroad, living 20 to a room and getting paid £25 a week. I guess slave labour is carbon neutral" though. Has wikileaks got any dossiers on the abject failure of humanity who run FIFA? I hope the media attention for Qatar in 2022 will force them to deal with their rampant discrimination, human trafficking and slavery. Qatar: No stadiums, no history, unfavorable climate, no city of even 1m people, etc. Everything about it is wrong except the oil money. WTF? I understand FIFA trying to expand football in new regions, but my concern is for your general Joe Fan. Nothing to do with safety or heat, but what culture is in this place? What is there to see or do? I hate to bring up alcohol consumption but come on - where can a fella have a few points and a bit o' banter? Will good old fashioned singsongs be tolerated? Maybe the English, Dutch, Germans, Americans, Russians, Czechs, Irish (hopefully) can get by on fruit juice for a month. "The thumb-shaped Qatar peninsula," warns the Lonely Planet guide "is not exactly one of the world's major tourist destinations." The chapter on the Qatari capital is even less enticing. "Around the Gulf, Doha has earned the unenviable reputation of being the dullest place on earth." The following article from The Guardian explains Qatar's current stance on homosexuality and how Fifa's new "anti-discrimination taskforce" is trying to get the country to be more tolerant in hosting the World Cup. Perhaps most disturbing of all was this on Twitter: No Asians allowed:Racism in Qatar Shopping in Doha via You Tube. Where will Fifa go next for the WC, Greenland, the Galapagos Islands, the Maldives, surely they all deserve a chance. Sepp Blatter you are ruining football. How can Fifa allow a country to host an event such as a world cup when they have never even qualified for one? Does anyone think money has been used to get this one? Are they really going to play as host nation? They will be thrashed. Here's the reason football fans are outraged, Qatar is a tiny country and will be the smallest ever to host the World Cup. There are more people living in my Manhattan neighborhood than live in the entire country of Qatar. They keep calling this a World Cup for the Middle East. If that's the case, why isn't it being held throughout the Middle East? The 2002 World Cup was co-hosted by two different nations with huge populations; Japan and Korea. Also, every country that has ever hosted a World Cup has had their national team qualify for other World Cups. In other words, they have invested in their country's football development and earned the right to compete in the World's largest sporting event prior to hosting the tournament. No offense to Qatar, but they have never qualified for the World Cup. As the host country they get an automatic entry in to the tournament which means that a more deserving nation will miss the World Cup so that Qatar can get crushed in every game they play in. Brazil vs. Qatar would not make a highlight reel. Nations that deserve to host the World Cup more than Qatar include: Cuba, Haiti, Jamaica, Costa Rica, Scotland, Northern Ireland, Trinidad and Tobago and even North Korea. Why?..because all of these countries have played in past World Cups having gone through the actual qualification process and winning the right to play. In fact, more deserving countries in the Middle East include Saudi Arabia, Kuwait and the United Arab Emirates...all of which have had teams qualify for past World Cups. As an American I would have loved to have the World Cup held here again, but I didn't think that was fair as it was just held here in 1994. For the same reason I felt that South Korea and Japan didn't deserve it as well. The country that really got hosed was Australia. They've qualified for World Cups in the past, there are many Australian born footballers playing in professional leagues around the world as well as at home in the A-League. The country has an amazing climate, a multi cultural population, beautiful cities, stadiums that are already built and most of all, they have never held the World Cup before. They've earned the right to host the World Cup. Qatar was pretty much just handed it. It seems like just yesterday that Atlanta United defeated Portland to win the 2018 MLS Cup. In fact, it wasn’t that long ago; December 8th to be precise. That’s why it’s amazing to see that all 24 teams have already begun their preseason training. Unlike other major US sports, these players don’t get much down time. Each match has two 45 minute halves where the players are constantly running. Outside of injuries, the play continues. There are no commercial time outs, like in the NFL, NBA and NHL. As for baseball, I do love the sport, but the amount of down time in a baseball game can be excruciating to the casual fan. I have nothing but respect for any athlete that is able to make it at the professional level, but let’s look at the physical requirements for athletes of each sport. According to Gizmodo soccer players run between 6-7 miles for each 90 minute match. That is far more distance covered by athletes in other sports. Wide receivers and cornerbacks run an average of 1.25 miles per game Also, keep in mind that the average amount of ACTUAL action in an NFL game is just 11 minutes. Let that sink in. NBA basketball players average just under 3 miles per game. In baseball, there are short burst of running here and there, but mostly it’s a lot of guys jogging back to the dugout and standing around between pitches. Hockey players are probably the closest in terms of physical conditioning to soccer players. The average player covers 5 miles per game which amounts to 410 miles throughout the course of the NHL season. The bottom line is there are different skills required for each sport. NFL players are generally strong, NBA players can jump high and baseball players must have good hand-eye coordination. But let’s be honest, can you possibly compare Cristiano Ronaldo’s athletic prowess to that of Bartolo Colon? Soccer players get very little time off. The season lasts 9 months, with at least one month of preseason. The baseball season is long and with spring training can go on for about 8 months. The NBA and NHL seasons last 7 months. As for NFL, the average team puts in less than 6 months a year. Plus, while NFL games are insanely physical, the season is only 16 games in total. That is nothing to compared to the number of games played in the other professional sports. So, which athletes do you think are the fittest? 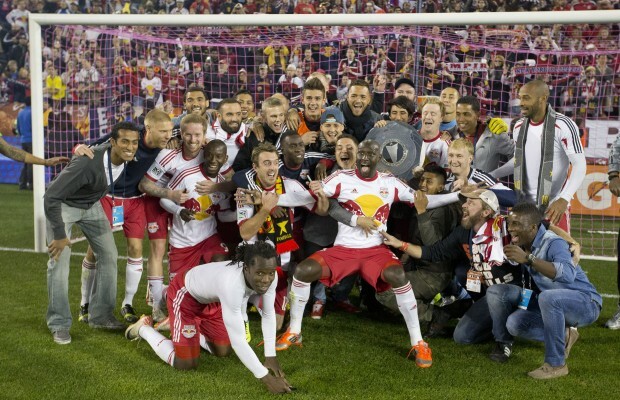 Major League Soccer just celebrated its 25th year of existence. The league has grown exponentially since 1993 and is now comprised of 24 clubs. In addition, MLS has also attracted some big name players over the years. The list includes household names such as David Beckham, Thierry Henry, David Villa, Wayne Rooney and Zlatan Ibrahimovic, just to name a few. While many fans of the international game often claim that these well-known players come to the states for “retirement”, these stars have helped raise the profile of the domestic league. To be fair, it is true that if you are a top athlete, playing soccer abroad gives you the chance to play at a higher level along with a larger pay scale. It works the same in other sports as well. Take for example NBA basketball. There are leagues in other countries throughout the world, but when players such as Dirk Nowitzki of Germany or Tony Parker of France get the chance to play professionally in the states they take it. The reason, the basketball league in the states is better than those back in their home countries. Right now there are 108 international players in the NBA. So for this fact, it’s very encouraging to see that currently there are 145 Americans playing soccer abroad. Borussia Dortmund midfielder Christian Pulisic who will be joining Premier League side next season. 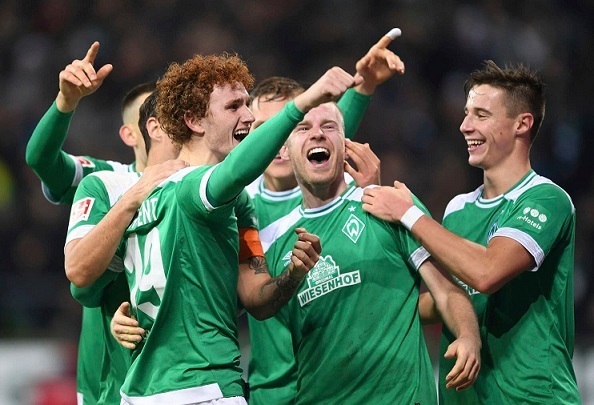 18-year-old Josh Sargent who is beginning his career with Werder Bremen of Germany’s Bundesliga. Defender DeAndre Yedlin is currently a starter for England’s Newcastle United. Striker Timothy Weah plays for Paris St. Germain and just joined Scotland’s Celtic on loan for the remainder of this season. Goalie Ethan Horvath is the starting keeper for Brugge in Belgium’s top league. 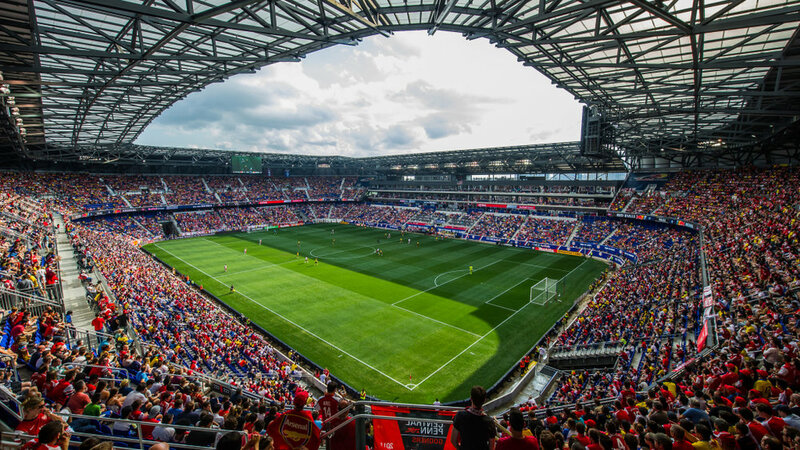 The continued growth of MLS as well as the number of American born professional players is a sign that the state of the game in the United States is very bright. Why do we call "football" soccer? Here in the US what we call football is entirely different than what most of the rest of the world think of as football. I totally understand why “American football” is often mocked by followers of soccer/football outside of our country. Face the facts, the word football by definition refers to a ball that is maneuvered by the foot. NFL football is more about passing and running with the ball followed by an occasional field goal or extra point scored by a kicked ball. A recent paper by University of Michigan professor Stefan Szymanski explains that the Brits are partly to blame. “The rugby football game was shortened to ‘rugger,’ and the association football game was, shortened to ‘soccer’”. So, while Americans are often ridiculed for calling the world's most popular sport "soccer", the reason we don't call it "football" like the rest of the world is Britain's fault. The Brits still used the term "soccer" regularly for a huge chunk of the 20th century. According to Szymanski, between 1960 and 1980, "soccer" and "football" were "almost interchangeable" in the UK. So there you have it folks. To make it easier let’s just say that the game played with 11 a side with the objective to get the ball in the back of the net is football or soccer. The game with a quarterback and receivers attempting to get a pigskin in to the end zone is American football.